Do you want to learn a new skill and get a great cardio workout simultaneously? Feeling stressed from work? Have some extra energy to spend? 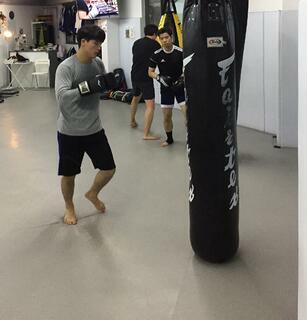 Come and join me for a kickboxing workout in a Seoul Mixed Martial Arts gym that offers kickboxing, jujutsu (also known in the West as jiu-Jitsu), and weight training. Rather than just running on a treadmill, kickboxing offers the three-fold benefits of fitness, self-defense, and mental strength. Your fitness will develop through intense cardiovascular or aerobic training; the heart and lungs will become stronger as the cardiovascular system begins to process and deliver oxygen more quickly and efficiently to all areas of the body. Self-defense skills that are applicable and useful for competition or real-world scenarios are built and strengthened through repetition of combination of kicks, crosses, hooks, uppercuts, roundhouses, blocks, and sparring with a partner. The intensity and beneficial pain of giving and receiving kicks and punches at a challenging intensity and pace along with the various combinations will ensure the mental strength and focus of anyone will grow and develop. 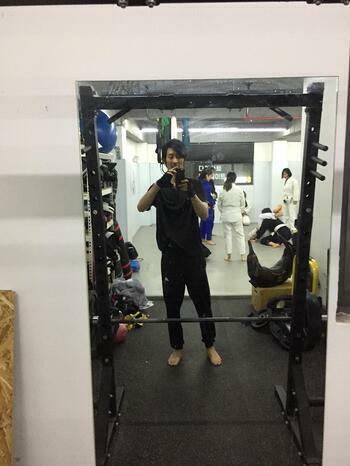 I suggest checking out a few gyms personally during class times and just take 10 or 15 minutes to observe the instructor and members and get a feel to see if it might be a good fit for your kickboxing or martial arts needs. When discussing membership and payment options, ask the owner or desk staff if a class is available to try for free. If this option is available, you can give the class a test drive and a much better idea of what to expect and how much you will benefit from each class will present itself. I decided the best option for me was to maintain flexibility with a busy schedule. 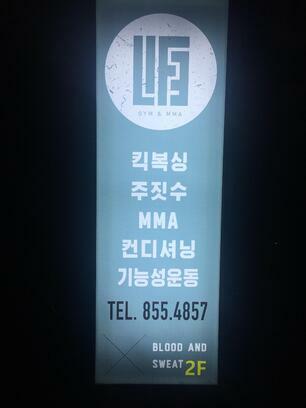 Therefore, I purchased a 10-session option for $160 with Life Gym & MMA. This allows me to come to any 10 classes at $16 per class which is reasonable. Not locking into a membership or contract gives me the option of easily moving to another gym should I wish to. On a rare evening where ChungDahm classes end at 7:00 pm, I speed off to catch the bus to Dangsan Station and then to Sindorim Station where I head home to pick up my gym bag and down a homemade smoothie consisting of 2 raw eggs, Greek yogurt, a banana, and orange juice. These calories and energy are needed for such an intense workout. Class starts at 8:15 pm and begins with a warmup. As a side note, physical space is a treasured commodity and at a premium in Korea, and this is no exception for gyms. Please expect the gym to have a very small space for lockers and showers. Also, remember to take off your shoes before entering the gym, I made the mistake of entering with my shoes on as is expected in Canada, and I was on the other end of some dirty looks. Grab a skipping rope. I’m still getting accustomed to being barefoot during the lesson as I was always wearing runners during my boxing lessons at legendary Huf Gym in Canada. Despite the difference in footwear customs from East to West, the typical practice of jumping rope is the same for kickboxing and boxing on both sides of the world. Three sets of three minutes of skipping and each set is followed by a thirty second rest. I personally noticed that jumping rope with bare feet on a mat put much less strain on my feet, ankles, and knees especially since I have very flat feet and overpronation. Next, warmups continue typically involving 3 sets of burpees while my assigned sparring partner does planks and then vice versa. On other days, we will work on hip mobility as the partner holds one leg by by his hip and I rotate my hips in and out and subsequently switching legs to ensure balance. This is very beneficial to develop flexibility as kicking with power and fluidity is important during the main workout session. The class is usually split 50/50 male and female and divided into pairs by the instructor according to size, skill, and strength. Next, the instructor will go through a quick demonstration of the punching or kicking technique and combination set. We practice for 3 minutes and then alternate roles. If I am working on a punching combination, the partner will be wearing focus mitts to present a target and to absorb the punishment. The most common combination is the 1-2 (Jab-Right Cross), I will throw a left jab followed by a powerful right cross as the partner yells out 1-2 while moving around to present different angles and fight scenarios. Expending maximum energy and force for even 3 minutes is very challenging and I found myself gasping for air as I began the training, but each workout I found myself getting stronger and much less winded. While on the receiving end of punches, I found out the best way to absorb punches and get used to them while building strength and stamina is to hit back as well. When I first started, I was just taking the punches and that hurts and fatigues your hands and shoulders. The technique I use is to present the target and meet his punch at the 70% mark, therefore, I am not receiving 100% of the force. When my partner is throwing his combination, I move my focus mitts about 30% towards him so that he has some resistance and I can also better absorb the onslaught of punches. Another combination our class practices is the 1-2-3-2 (Jab-Cross-Hook-Cross). After I throw a quick jab followed by a violent cross and then a blinding left hook, my partner will throw a punch with his mitt for me to dodge and then I will end the combo with a knockout right cross. This is where I develop physical stamina through intensity and also the mental focus by continuing the combination while under maximum exertion and fatigue. Kicking combinations can be even more intense and painful than punching. The key to kicking with power and fluidity is to keep your body as relaxed as possible. The more tense or stiff I am, the less I can really unload my kicks with ease and maximum force. Your partner will let you know when you are not using the right technique or are too tense. With a right roundhouse kick, the key is to rotate the lead left foot outward so that the hip has the space to rotate and generate power as the right leg makes contact with the thai pad that the partner will be wearing. When I am kicking with my lead left leg, I need to step in with my right foot pointed outward so that I can fully rotate my hips and strike with my left leg. 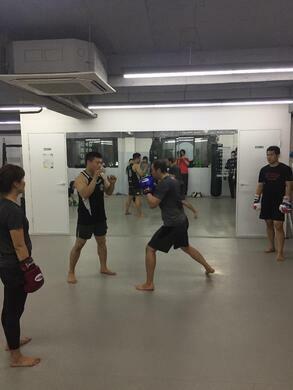 As I kicked more and more throughout the class, the initial pain, bruises, and soreness started to disappear from the contact of the shins and foot with the thai pads. My forearms also started to get conditioned to the kicking force and impact when receiving kicks. The best way to absorb the hits is to look straight at them without flinching and meet the kicks with as much force as you can. Punching and kicking combinations are also added such as 1-2-3-round kick (Jab-Cross-Hook-Roundhouse). This is the part of the class, where you need to dig deeper because everybody is exhausted and running on fumes. Mental focus is needed to maintain proper technique and physical stamina and strength is needed to still maintain intensity and deliver the blows with power and precision. At the end of the class, the cooldown period will normally consist of ab crunches with your partner and some stretching led by our instructor to maintain loose muscles and flexibility for optimal health future classes. Most gyms should also have a weight training section. At the end of the class, I like to do some full body compound lifts like deadlifts, squats. I also like to use the Bulgarian bag. It’s a great way to build and maintain muscle, power, and strength in addition to cardio fitness. Thank you for joining me for a kickboxing class Korean style and I hope that as a ChungDahm teacher you will have the opportunity to experience a kickboxing or martial arts class in Korea. I know you will have fun while also making friends and developing your self-defense skills, mental fortitude, and physical conditioning.